Dr. Brian Baugh asks students to solve a hedging problem in his derivatives class. Dr. Brian Baugh, assistant professor of finance at Nebraska Business, started his professional career as an engineer at Boeing. He reported to his first day on the job equipped with a strong background in mathematics, engineering and hard physics and his undergraduate degree in mechanical engineering from Brigham Young University. Then something happened during Boeing’s onboarding process which changed the course of his life. Baugh immediately picked up a dozen investment books and started teaching himself a new career path destined to change not only his life, but all those he would meet along the way. He earned both an MBA and a Ph.D. in finance as part of a mission to raise the level of financial literacy in himself and the world. “I’m a bit of an outlier in the world of finance academia. I specialize in household finance and it’s kind of a new field. A lot of universities don’t have a strong hold in that area,” he said. After completing his doctoral dissertation at The Ohio State University on pay day borrowing, Baugh continues his household finance research at Nebraska on topics such as how people allocate spending based on tax refunds, personal spending based on pay period cycles and the impact of state income tax assessments on people’s online purchasing habits. 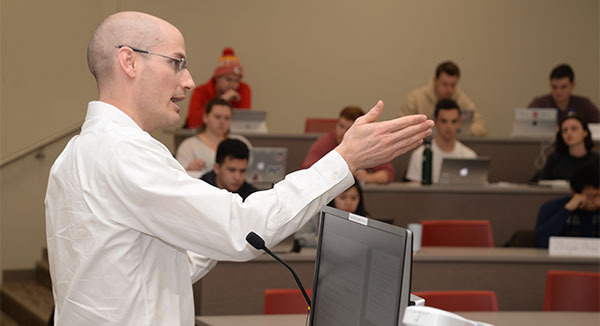 Beyond his research, Baugh also perseveres in the classroom by impacting the lives of Nebraska students such as Anthony Hare, a junior finance major from Alliance, Nebraska, who took Baugh’s introductory finance class (FINA 361H) with members of his Nebraska Business Honors Academy cohort. Baugh instructs Nebraska Business Honors Academy students to better prepare them for long-term investing success. “What inspired me is he spends time talking about his personal finances and investments, so as students, we see he’s applying the same concepts he teaches in his own life. He gets super excited for every class and nerds out over the minutiae of tax laws and retirement planning. I’ve already taken actions based on being in his class, especially when he educated us on fees behind mutual funds. I changed my own funds to make them cheaper. Several classmates also acted on investing in low-cost index funds which he recommended,” said Hare. One of those classmates, Kevin Woolworth, a junior from Olathe, Kansas, who is also in the Nebraska Business Honors Academy, described Baugh as very animated in urging students to spend wisely and save money to retire early. As a management major, Woolworth does not possess a natural inclination to the mathematics behind finances, but explained Baugh makes it easy to stay engaged. Baugh’s influence goes beyond the student body. Whether it’s a colleague, a friend or maybe even the dean, his influence can be felt everywhere. Baugh believes the inspiration is reciprocal. He gets a glean in his eye when he writes down the title of a book on how to best invest for a colleague, or sees a student begin to change their financial management choices. “It’s most inspiring to me when students not only understand but get excited about the material I’m teaching. It’s rewarding to see a tangible outcome by another person, whether it’s opening a Roth IRA or investing in index funds. Basically, nothing can make me happier than that,” Baugh said.